I am trying to connect to an Arduino Board with HC-05 Bluetooth module, to do so I have used library examples from Arduino IDE. The fact is that Bluetooth connection is established because HC-05 led confirm that (stop fast blinking) and I can switch Arduino led on and off from Blynk Android app, but Arduino can not send data to virtual pin. I am trying using last beta app as some of you suggested on others post and I am also using #define BLYNK_USE_DIRECT_CONNECT and no changes. 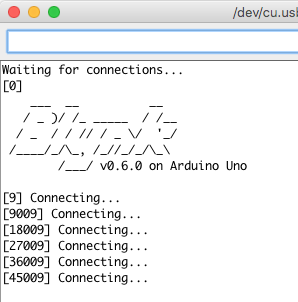 I have try older library releases and older android app, just for testing and with Blynk_Release_v0.3.10 Arduino Library it connects and fully works for a short time after starting the android app, and then start sending “Connecting…” and stop working again. As you will read, you will probably need to try the beta App to see if that makes any difference. Hi Gunner, thanks for your fast answer. I am using last beta version of the app and I have try rest of other recent topics about BT connection issues recommendations yet. It is the first y have done. I have seen that today has been released a new beta version, when it become active on play store I will update and test it. I have seen yesterday has been released a new beta version and I have installed it and tested and It seem to work well. To work fine we have to power arduino first and then press Play Button on our Blynk app. Some unusual times it disconnects and we have to press Stop Button and then Play Button another time and it connects again and continues working. Y have a adittional question: Why did my topic category changed to “Need Help With My Project” if my project is ok and it is really a bug? I changed it as I do not see Beta testing as a “bug issue”, per se… but that may be just me … and yes, anything BT/BLE related has been indicated as Beta since as long as I have seen. Beta testers have the App based LOG submission for posting issues with their tests. That and under the appropriate announcement topic I guess. Besides, the Devs don’t seem to respond any faster if RED topic or not.